Matambre is a typical and savory Argentine staple consisting of flank steak (beef, or pork) prepared on the grill, in the oven, or boiled and stuffed with egg and vegetables. Matambre actually comes from the word mata (kills) and hambre (hunger) and got its name because it is a fast cooking meat that Argies peck at while the rest of the slow cooking asado sizzles on the grill. This local delicacy is well worth trying. The stuffed version (Matambre arrollado), available at any deli store (fiambreria), works very well as sandwich meat, a good picnic alternative. You can also share this typical Argentine food with friends and family by making your own! 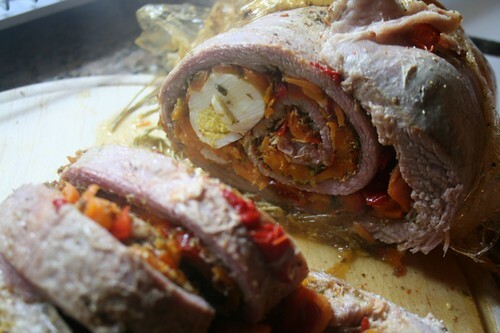 See the Matambre Arrollado recipe below. Flavorless gelatin or 2 beaten eggs with parmesan cheese. 2- Combine the marinade ingredients in a deep dish and allow the flank steak to sit in the marinade overnight if it’s made with milk, or for a few hours if done with the vinegar and wine. 3- Boil the eggs, grate the carrots, and finely chop the garlic and the parsley. 4- If you choose to oven bake then spread the flank on a large piece of foil with the fatty side up, if you’re going to boil then skip the foil. 5- Spread with mustard (optional), sprinkle with salt and cover with garlic and parsley. 6- Place the spinach leaves along the flank. 7- Cover the spinach with the bacon. 8- Spread the grated carrot on top. 9- Place the eggs in a long side row at around 4 cm from the border of the flank. 10- Sprinkle with the gelatin powder or cover with the egg and parmesan mixture (this is to hold the filling together). 11- Roll up the flank. If you’re baking then roll it with the foil and secure the ends well with toothpicks and bake in the oven for approximately 1 hour per flank kilo. If you’re boiling sew the all the edges with a needle and thread. 12- Wrap the flank roll in a light cotton cloth and tie up with cotton string. 13- Boil the roll in salted water for approximately 1hour per kilo of flank (the flank you choose should weigh around 2kgs). 14- Remove from the water and place a cutting board and something heavy on top whilst it cools for approximately 5 hours. 15- Remove the cloth and strings and serve sliced. This entry was posted in Food & Drink and tagged asado, Matambre, meat, recipes, stuffed flank steak, typical argentine food, What to try in Argentina by Fierro Hotel Staff. Bookmark the permalink.